The mother was a 24-year-old primigravida with twin gestation (monochorionic diamniotic) of spontaneous conception. An ultrasound examination at 20 weeks of gestation showed TTTS, and hence, laser photocoagulation of placental vascular anastomoses was done. Postprocedure, the donor fetus developed hydrops fetalis and the recipient fetus showed a high middle cerebral artery peak systolic velocity. Subsequently, the donor fetus showed ventriculomegaly on neurosonography though hydrops had significantly reduced. 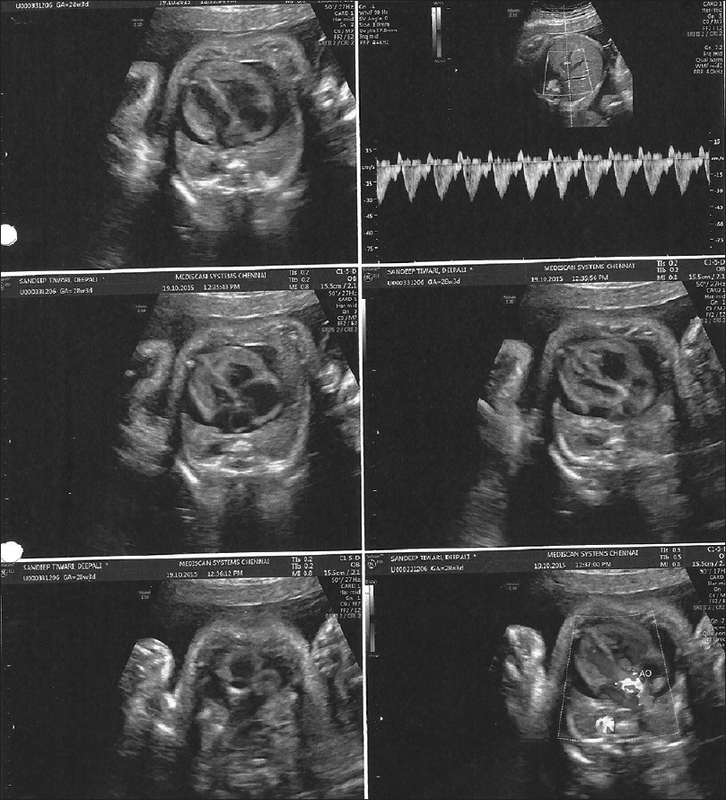 Both twins developed polyhydromnios possibly giving the diagnosis of twin reversed arterial perfusion sequence. Bipolar cord occlusion of the donor twin was done as per the parents' decision. Thereafter, the recipient twin showed calcifications in ascending aorta and proximal portion of the pulmonary artery with high-velocity flow in both vessels on fetal ultrasonography. Pericardial effusion was consistent and persisted throughout the entire gestation. Fetal echocardiography of the recipient twin showed hyperechogenicity in the root of the pulmonary artery and aorta, excluding the valves and extending beyond the sinotubular junction in the aorta. The antegrade flow was seen across pulmonary artery and aorta with high velocity, and also calcifications were noted in the distal descending aorta. Institutional delivery was advised and regular monitoring was carried out till delivery. Baby was delivered by cesarean section at a gestational age of 32.1 weeks, with the weight of 1840 g.
Serum calcium was 9.4 g/dl with ionic calcium of 1.18 mmol/L. Chest X-ray was unremarkable. Neonatal echocardiography was performed in the Neonatal Intensive Care Unit (NICU), which showed calcification of the main pulmonary artery and descending thoracic aorta with a maximum gradient of 10 mm Hg, a small patent ductus arteriosus, and a patent foramen ovale. Serial echoes showed no increase in the flow velocities across the great vessels. Cardiac computed tomography showed calcification of the great vessels (both aorta and pulmonary atery). There were no calcifications elsewhere in the body. Genetic studies for Idiopathic Arterial Calcification of Infancy (IACI) were negative. Initially, bisphosphonate was planned as therapy but was withheld in view of no progression of calcification or deterioration of clinical status. The neonate was closely monitored in the NICU and discharged with a good weight gain on day 25 of life. The baby has been asymptomatic and follows-up regularly with blood pressure monitoring. 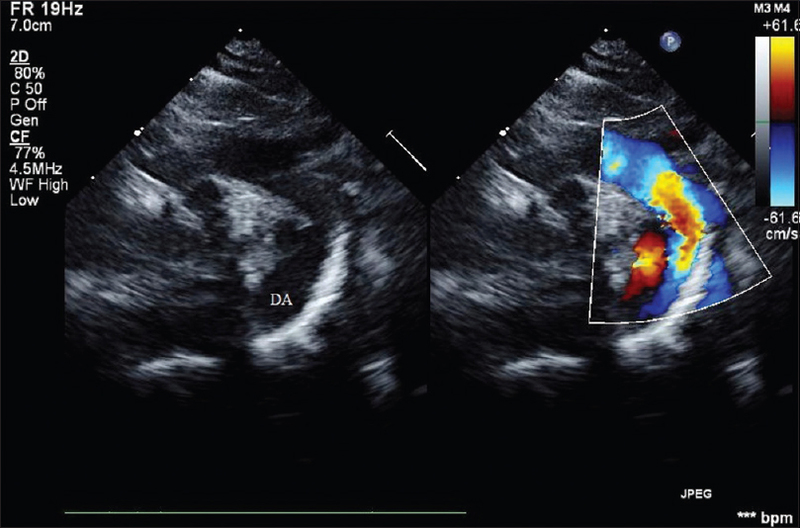 Following [Figure 1] and [Figure 2] shows calcifications in descending aorta and pulmonary artery while [Figure 3] shows cardiomegaly in fetal heart. TTTS is a rare, nonhereditary entity with a worldwide incidence of 8–12% and a poor fetal prognosis when untreated. Neonatal mortality reduces to 20–30% on serial amnioreduction in such cases. This procedure reduces premature labor and thereby the mortality rate. Events leading to TTTS in pregnancy include the time of twinning, sharing of the placenta, and connecting vessels by the twins. The reported cardiac complications seen in TTTS include ventricular hypertrophy, right ventricular outflow tract obstruction (pulmonary stenosis), tricuspid regurgitation, congestive cardiac failure, left ventricle hypoplasia with hypokinesia, and subaortic obstruction, with incidence being more in the recipient twin. No definitive therapy and a high mortality rate have been associated with this condition in most of the case reports mentioned in literature. IACI is the only differential diagnosis for the condition which is a rare, autosomal recessive disorder where widespread calcifications occur in large- and medium-sized blood vessels such as aorta, pulmonary vessels, coronary arteries, renal arteries, and extravascular sites such as adipose tissues, kidneys, and periarticular region. Genetic study in the form of mutation analysis is the only investigation for confirmation. The study by Hamazaki  mentions that idiopathic calcification of infancy is an elastic fiber defect where calcification occurs in the internal elastic lamina, followed by the calcium encrustation. Materials that stain with mucopolysaccharides accumulate around the elastic fibers. Deposition of hydroxyapatite and smooth muscle cell proliferation occurs in association with periarticular calcification. Karatza et al. found that there was no hemodynamic difference in monochorionic and diamniotic twins. Aortic and pulmonary velocities were more in recipient twin as compared to donor twin. Furthermore, Samon et al. mention that idiopathic calcification of the great vessels occurs in the recipient twin in a case of TTTS, as in our case. Calcification of the great vessels is seen due to excessive volume overload in the recipient twin in cases of TTTS. Antenatal ultrasonography is useful to identify hyperechogenicity of vessel walls or polyhydramnios in cases of multiple gestation which aids early recognition of the condition. Serial monitoring during pregnancy and postnatal life is imperative to reduce morbidity and mortality associated with this syndrome. We acknowledge Dr. Vandana Bansal, Perinatologist - Nowrosjee Wadia Maternity Hospital, and Dr. Y K Amdekar, Medical Director of B J Wadia Hospital for Children. Zosmer N, Bajoria R, Weiner E, Rigby M, Vaughan J, Fisk NM. 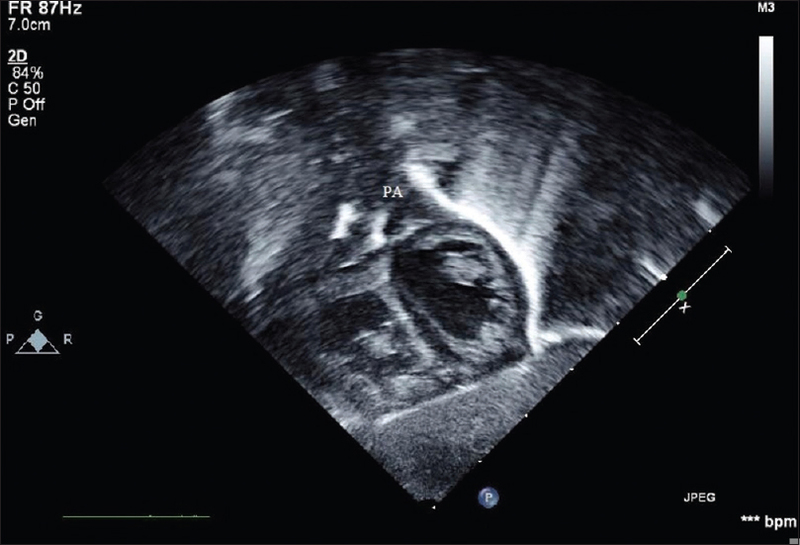 Clinical and echographic features of in utero cardiac dysfunction in the recipient twin in twin-twin transfusion syndrome. Br Heart J 1994;72:74-9. Urig MA, Clewell WH, Elliott JP. Twin-twin transfusion syndrome. Am J Obstet Gynecol 1990;163(5 Pt 1):1522-6. Marton T, Hajdu J, Papp C, Patkos P, Hruby E, Papp Z. Pulmonary stenosis and reactive right ventricular hypertrophy in the recipient fetus as a consequence of twin-to-twin transfusion. Prenat Diagn2001;21:452-6. Murakoshi T, Yamamori K, Tojo Y, Naruse H, Seguchi M, Torii Y, et al. Pulmonary stenosis in recipient twins in twin-to-twin transfusion syndrome: Report on 3 cases and review of literature. Croat Med J 2000;41:252-6. Elliott JP, Urig MA, Clewell WH. Aggressive therapeutic amniocentesis for treatment of twin-twin transfusion syndrome. Obstet Gynecol 1991;77:537-40. Saxena A, Soni NR. Pulmonary artery calcification in recipient twins of twin to twin transfusion syndrome: A report of three cases. Pediatr Cardiol 2003;24:80-3. Vera J, Lucaya J, Garcia Conesa JA, Aso C, Balaguer A. Idiopathic infantile arterial calcification: Unusual features. Pediatr Radiol 1990;20:585-7. Anderson KA, Burbach JA, Fenton LJ, Jaqua RA, Barlow JF. Idiopathic arterial calcification of infancy in newborn siblings with unusual light and electron microscopic manifestations. Arc Pathol Lab Med1985;109:838-42. Hamazaki M. Idiopathic arterial calcification in a 3-month-old child, associated with myocardial infarction. Acta Pathol Jpn 1980;30:301-8. Karatza AA, Wolfenden JL, Taylor MJ, Wee L, Fisk NM, Gardiner HM. Influence of twin-twin transfusion syndrome on fetal cardiovascular structure and function: Prospective case-control study of 136 monochorionic twin pregnancies. Heart 2002;88:271-7. Samon LM, Ash KM, Murdison KA. Aorto-pulmonary calcification: An unusual manifestation of idiopathic calcification of infancy evident antenatally. Obstet Gynecol 1995;85(5 Pt 2):863-5.